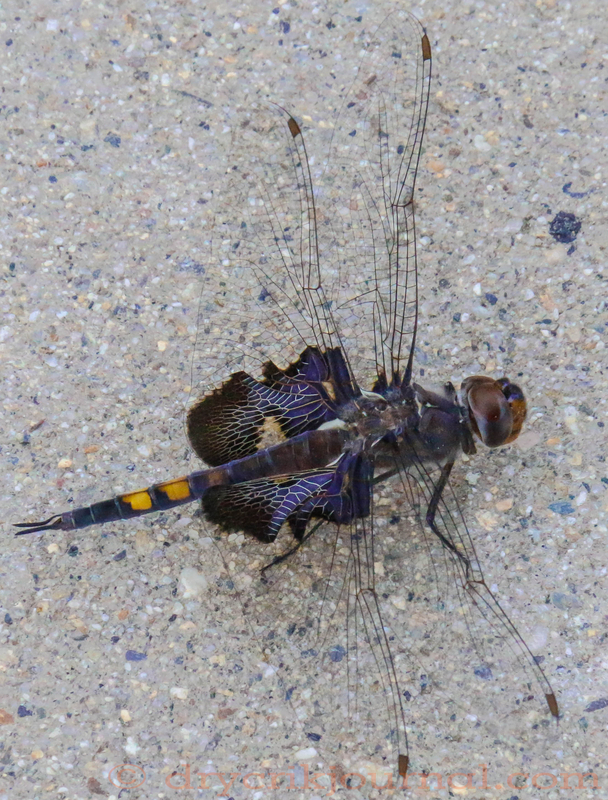 This entry was posted in Haiku 2015, Photographs, Poems 2015 and tagged dragonfly, weekly-photo-challenge. Bookmark the permalink. It seems the closer you get the more color you see, and there are so many different kinds (species) buzzing around this time of year. This one was cooperative, just sitting on the concrete apron of the shop. Usually if you catch one still, it’s in flight again before you get your camera focused. I had to look again and again in wonder—it looks like it’s on top of a purple iris! Never knew such a dragonfly exists! I’m sorry I didn’t catch this with my macro lens, but what we have here, I believe, is a breeding pair! Look again. I think what you have here is a single Black saddlebags male, Tramea lacerata, The male will grab a female by the head, then they will adjust their abdomens to be joined. Tramea lacerata. Thank you, Richard, you get the gold star, or nowadays, 5 gold stars.